Jiu-Jitsu, which means gentle art is the oldest form of martial art. It originated in India more than 2000 years before Christ. It was created by monks who could not use any type of weapons to defend their lives against barbarian attacks. It spread through China, and eventually took root and was elaborated on in Japan becoming the first martial art style. The samurai clans in Japan adopted Jiu-Jitsu as their own traditional style to defeat an opponent regardless if the situation was striking, throwing or grappling. With the passing years, they split the techniques and developed other martial arts styles, such as judo, akido, karate, etc. In 1914, Japanese Jiu-Jitsu champion Esai Maeda migrated to Brazil, where he was instrumental in establishing a Japanese immigrant community. His efforts were aided by Gastão Gracie, a Brazilian scholar and politician of Scottish descent. 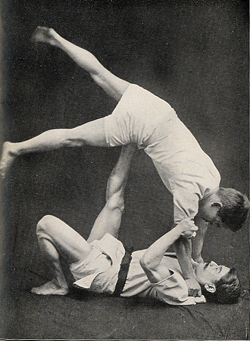 As an expression of his gratitude for Gracie’s assistance, Maeda taught the Brazilian’s oldest son Carlos the essential secrets of the ancient martial arts technique. Carlos taught Maeda’s techniques to his four brothers, and in 1925 they opened the first Jiu-Jitsu academy in Brazil. For the Gracie brothers, teaching the art was more than an occupation. It was their passion. Helio’s skills eventually enabled him to beat some of the world’s greatest fighters. Helio’s feats include the longest fight in recorded history – 3 hours and 45 minutes, nonstop – and the historic match against Masahiko Kimura, who was probably the greatest fighter Japan ever produced. Now in his 90’s, Helio Gracie still teaches and is widely recognized as a living legend. Helio’s quest became today’s Gracie Jiu-Jitsu, a martial art that is continuously evolving as a result of input from practitioners throughout the world. Much has been learned since the beginningwhen the Gracies began developing the sport. Rickson Gracie, one of Helio’s sons, has been the family champion for the past 20 years and is the ultimate embodiment of Gracie Jiu-Jitsu.